Walking forms a key aspect of the practice of the Lochbrow Landscape Project, an archaeological survey project based in Dumfries and Galloway. Since 2010, the project has been investigating the landscape and setting of a cropmark Neolithic-Bronze Age ceremonial complex and later prehistoric settlement enclosures using a variety of non-destructive survey techniques, methods that require a considerable amount of walking. These include the commonly employed techniques of geophysical survey, as well as an experimental experiential survey. While walking is an aspect common to all archaeological projects which make use of techniques and methods such as these, the process of coordinating and participating in this project over a series of short, yearly, field seasons has afforded time to consider the impact of this walking upon archaeological practice and interpretation. The process of extensive walking, often repeatedly over a small area of this prehistoric cropmark complex, of spending time within the same location on repeated occasions and of developing a method to consider the experiential aspects of the landscape has had an effect on the resulting interpretations and understanding of this site. In effect, this landscape is more richly understood through the feet. This paper is a personal reflection on the intimate connection and evolving perspectives that this walking has had on the author and the resulting interpretations of Lochbrow. The challenge now is to incorporate this knowledge into the ‘official’ interpretations of this complex landscape and allow this to enrich the archaeological narratives we build. 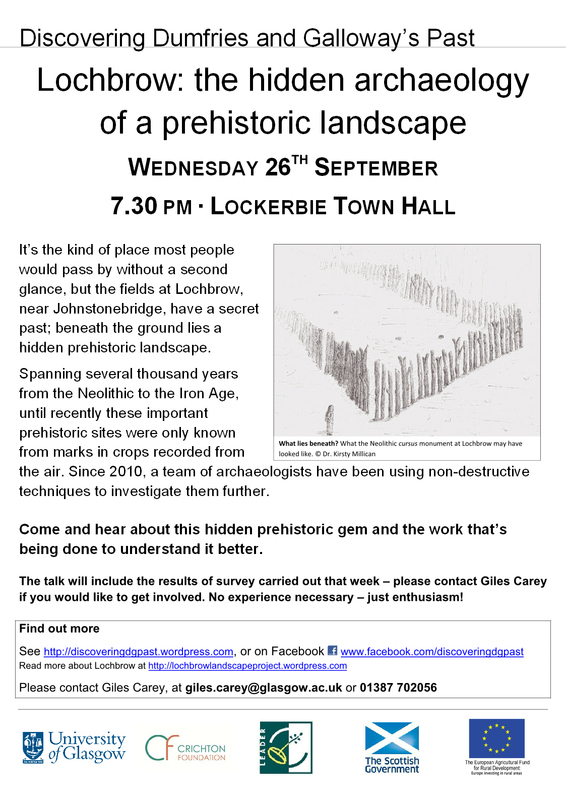 In association with Discovering Dumfries and Galloway’s Past, we will be giving a talk entitled “Lochbrow: the hidden archaeology of a prehistoric landscape” at Lockerbie Town Hall, Wednesday 26th September at 7.30pm. Come join us!